1.Delivery time: 2-3 business days for Amazon Prime. 7-10 business days via Royal Mail for standard shipping.3-5 business days via DHL when you purchase 3 packs or more. 2. 2.5g per piece,20 pieces/50g total included, you will need 2-3 packs for a full head application. Free tangle, feel smooth and softy to touch. 3. Can be curled, straightened, tongued, washed and restyled like your own hair. Our hair can not be dyed. Double process of color will lead the shedding and dryness. 4. Note: the picture is taken by ourselves, minimum color difference is assured, could match your hair easily. Color matching service is available. Please feel free to contact us. Long beautiful hair is a sign of radiance, health and luxury. Tape in hair is a great choice for anyone with almost any hair type, which is fast, fun and easy. and Sunny Hair tape in hair extensions prove to be an effective way to change your appearance but they will need some care and maintenance. Hair Texture: Straight, Please note that hair gets a little wavy after washing or improper packaging, this is normal. 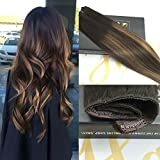 How to apply tape in hair extensions? 1.Wash and dry your hair completely before starting. 2.Never install at the crown or too close to the nape of the neck. 3.Make two extensions strips are glued together with a part of your own hair in between them. 4.Be sure to seal the tape with a flat iron for maximum adherence. Make sure that do not wash your hair at least 48hours after the application, otherwise this will cause slippage. The difference between single and double drawn hair? Single drawn is the most commonly hair extension type on the market about the lower price and shorter production time.With double drawn giving a greater quality of hair extension. You will pay more for double drawn hair, but the quality, volume and thickness can hold longer than single drawn hair extensions.If you need double drawn,Please contact us,we could also provide high quality double drawn hair extensions. There is a card in the parcel together with the hair. Please read the caring card carefully before washing hair. Please feel free to contact us if you have any problem,To let our every customer satisfied is the aim of Sunny Hair.